Let me write a couple of words about myself for those who has recently joined the blog. I'm Russian living and working in Moscow - the capital city. 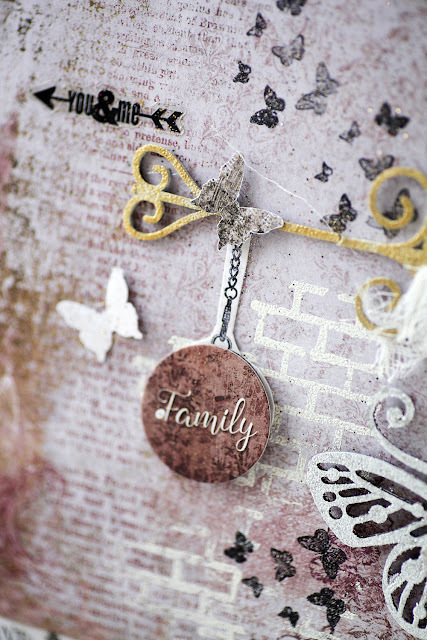 I'm a big fan of scrapbooking, papercrafting and quilting. 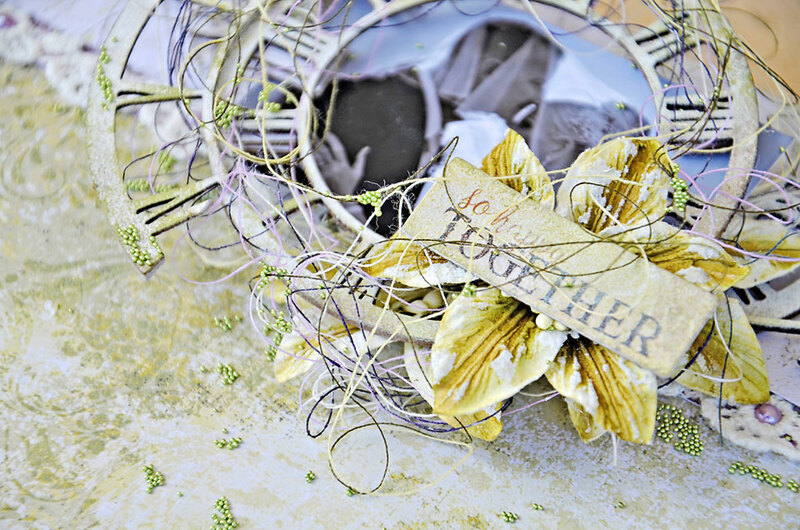 I can't imagine my crafty space without paper and scissors. Almost all of my layouts are telling stories about my family which consists of two young men: my 6 year old son and my hubby. 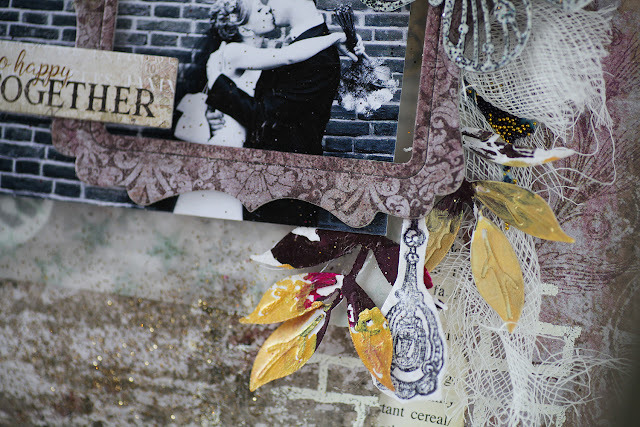 Scrapbooking is not only my hobby. It is my job and my lifestyle. I own a small shop on Etsy and occasionally teach people papercrafting. Last year I started to make my Wedding album with amazing Blue Fern Studios papers and embelishments but I feel like I need more layouts to achieve the goal. So today I will share some new wedding layouts with Remnants papers and printed chipboards. The first one is experimental as I've never made layouts with huge photos. I've taken Remnants - Devonshire for the background and embelished it with Remnants printed chipboards, the fence covered with Antique gold embossing powder and leaves covered with Lime and Aocado embossing powder. 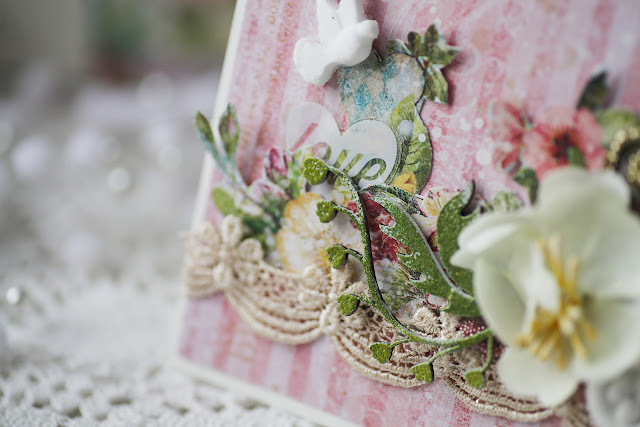 With some Meadow seedlings, Apricot and Heartland blossoms and Lace the layout looks full of tender feelings. 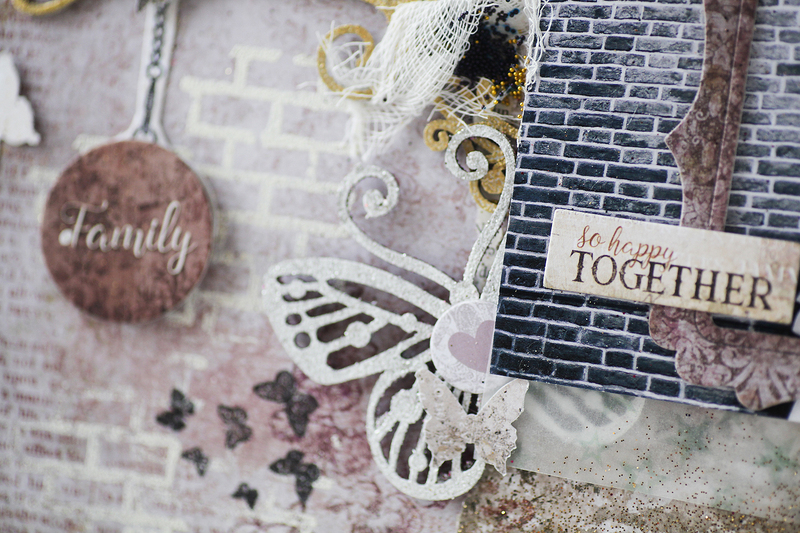 The other layout is more brutal, One of the photo locations was a brick wall so I tried to imitate the pattern on the background with the help of Essental Textures stamp and the new Ivory Embossing powder. And for the dessert today I prepared two Valentine cards for someone really special. I switched my attention to the amazing Heartland collection which I love with all of my heart. Heartland - Bicycle for Two and Red Rose Ball as background and for fussy cutting. And of course you have noticed the Fresh florals. 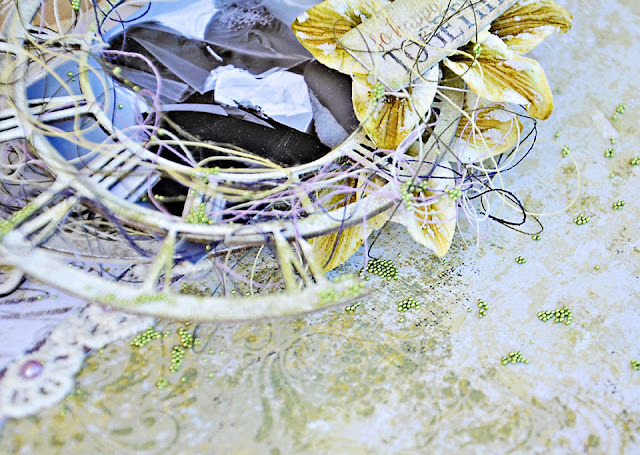 I thank everyone for stopping by and wish you a good crafty season with Blue Fern Studios! 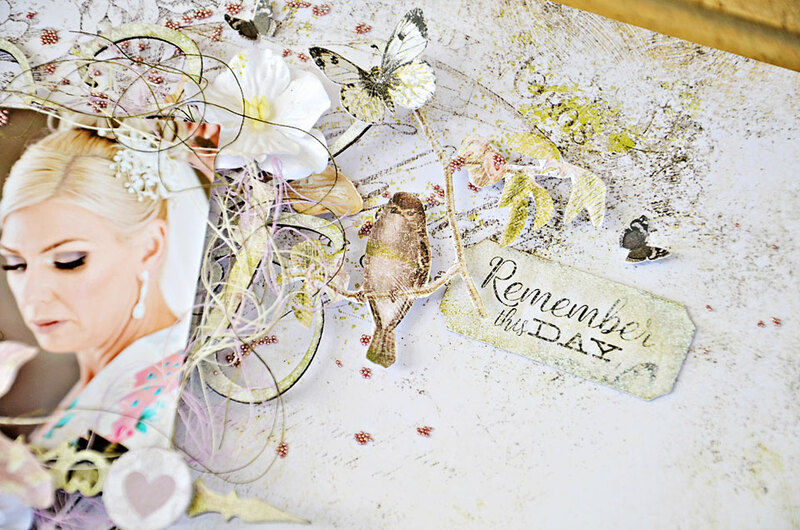 This week, Pam Ellis, our Blue Fern Fan of the Month, has created a layout in memory of her mother, who lost her battle with cancer in 2011. What a beautiful tribute to her mother, who she cared for when she was ill.
Pam used this beautiful sepia photo of her mother along with paper from the Remnants collection. To the background she applied modeling paste through a rose patterned stencil, and then used purple mist. The Faded Bloom chipboard piece was cut and used in two places in her design, and serves as an area to place the title. Pam also cut tags from the paper to use as layering elements. 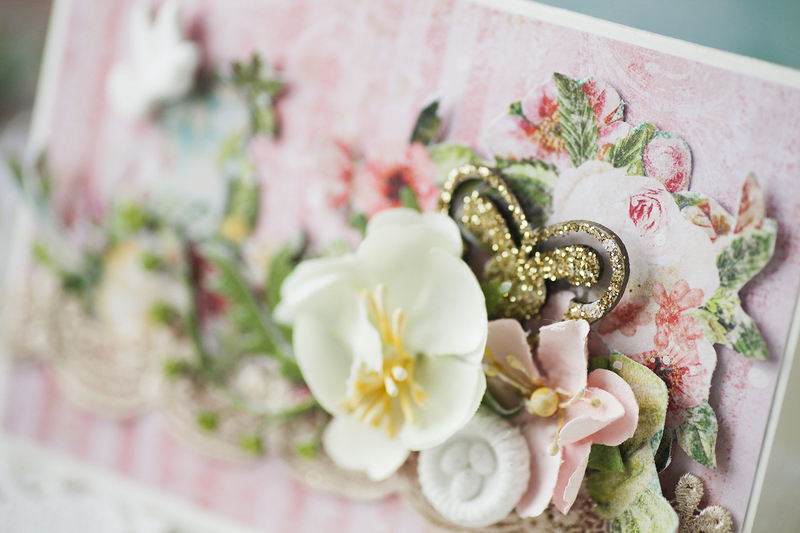 A few pieces from the Printed Chipboard and flowers from the Remnant Florals added the finishing touches. Thank you Pam, for sharing your layout and memories of you mother. 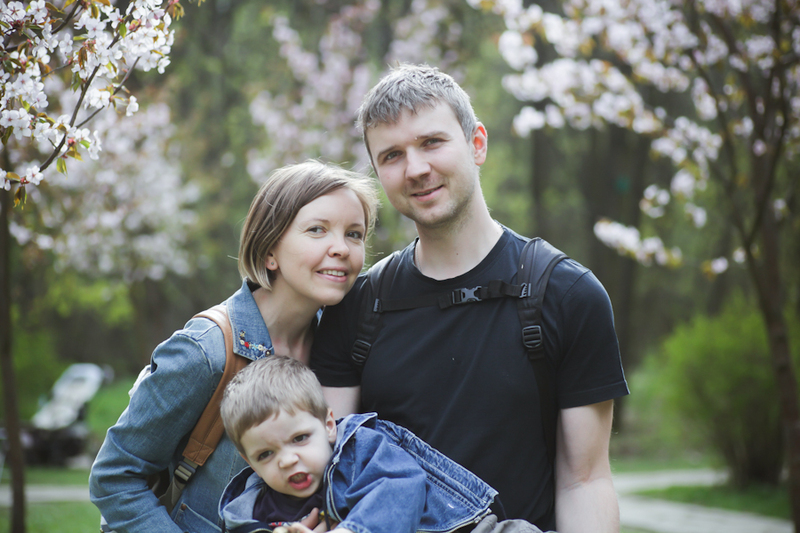 It's possible to be added to Blue Fern Studios design team this time. When a picture of its wedding is being put in order in 2006. I knew a scrap booking. A picture is taken while enjoying child's growth after my daughter is born in 2012. The meaning is found very much to leave it by the shape as the scrap booking. 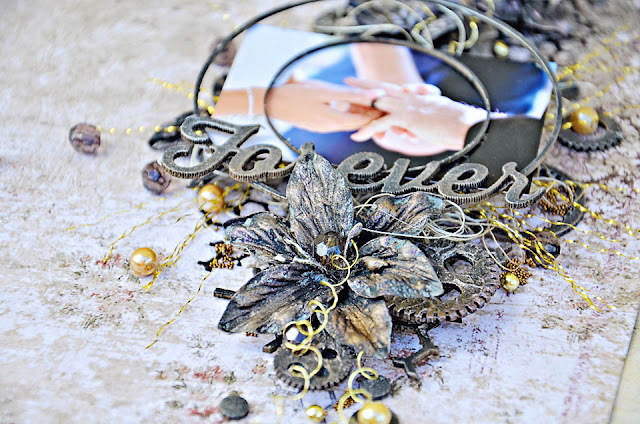 I experienced a design team of Blue Fern Studios. And it was added to a team again in 2018 this year in a wonderful thing! Of Blue Fern Studios, I'm elegant and like the chic and pretty atmosphere very much.
" The characteristic and the image the paper has, importantly. In order to utilize good of the paper", I'd like to make a motto a work. Chic and calm collection”REMNANTS" I used these and made a project. 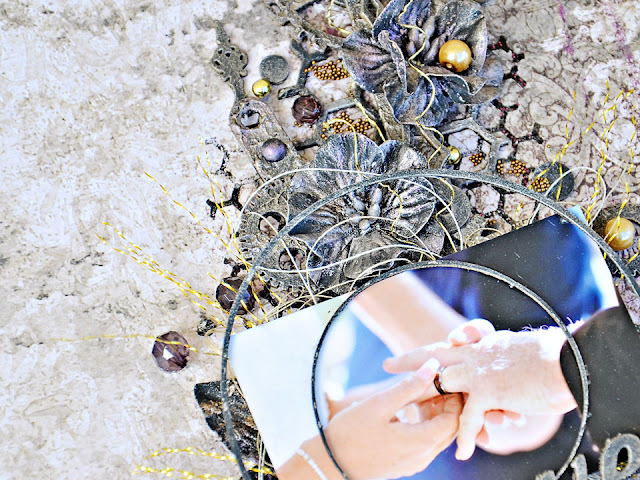 This layout was made with Christmas as the theme. hat have never existed has been made! ! ! I like the 12 inch size printed chip board very much! Embossed powder used for this chip board GLISTINNING SAND. t is wonderful with colors that are very nuanced! The race is also really gorgeous! This can also be used with kids' photos! Graduation ceremony etc for the coming season seems to suit ceremonies . This flower looks like an adult and is nice. with texture, as there is a presence. I am doing DTP with black ink. I used a lot of chip boards in this layout. The 3rd work was made with the picture of my daughter 's birthday. I thought " So pretty!" from sold time. It could be used finally! It fits a picture of the daughter's birthday! and embossed it with gold. I like BFS very much as expected! Thank you very much for seeing! Firstly I just wanted to say how happy I am to be part of the 2018 Blue Fern Studios Design Team. 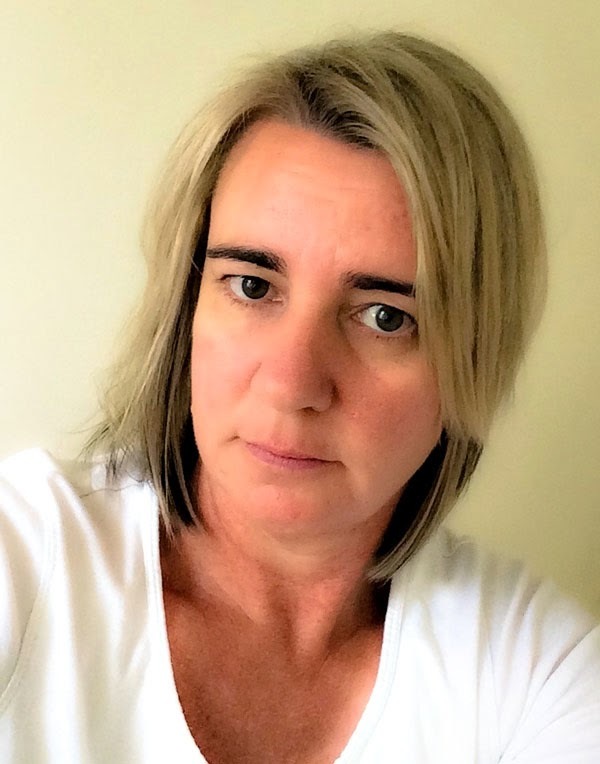 I am Joanne Bain from Queensland, Australia. I am a very proud mother of 2 and I am happily married to my best friend and have been for 24 years. He is the best husband a girl could ask for and is very supportive of my paper crafting. Most of my inspiration for this craft comes from my wonderful family and friends and also the beautiful array of products that are now available. When I am not scrapbooking, I am kept busy with all activities involving raising a happy family and I like dabbling around with photography which is perfect as I always have something to scrap. We live in sunny Queensland Australia along with our 2 dogs and more pet birds then I can count. 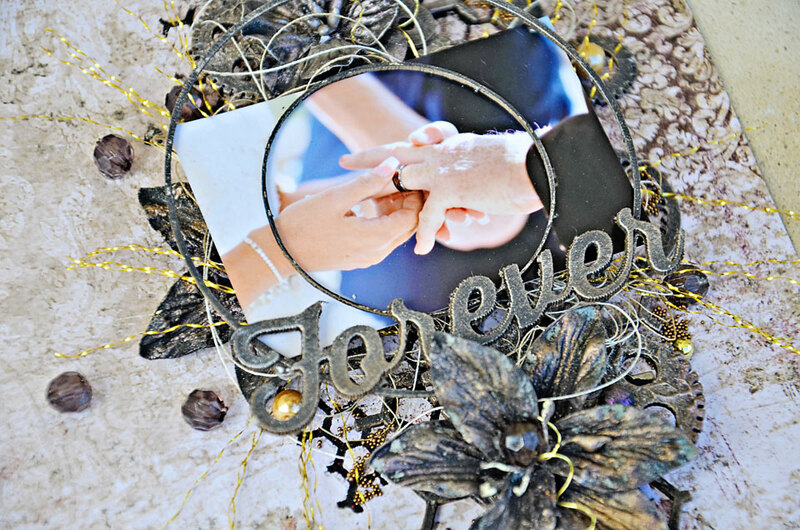 I have been a scrapbooker for 16 years since my daughter was the age of 3 and then 13 years ago along came the other special boy in my life my gorgeous son, many of my creations tend to feature them. From as far back as I can remember I was always doing some form of craft. 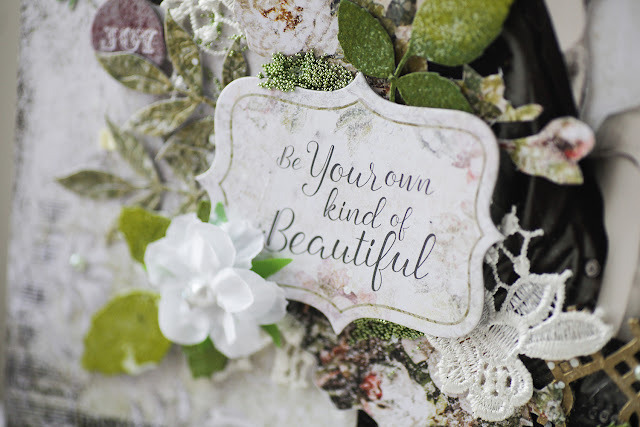 I have sewed, crocheted, knitted, painted and scrapbooked throughout my teenage years without even knowing it….lol. 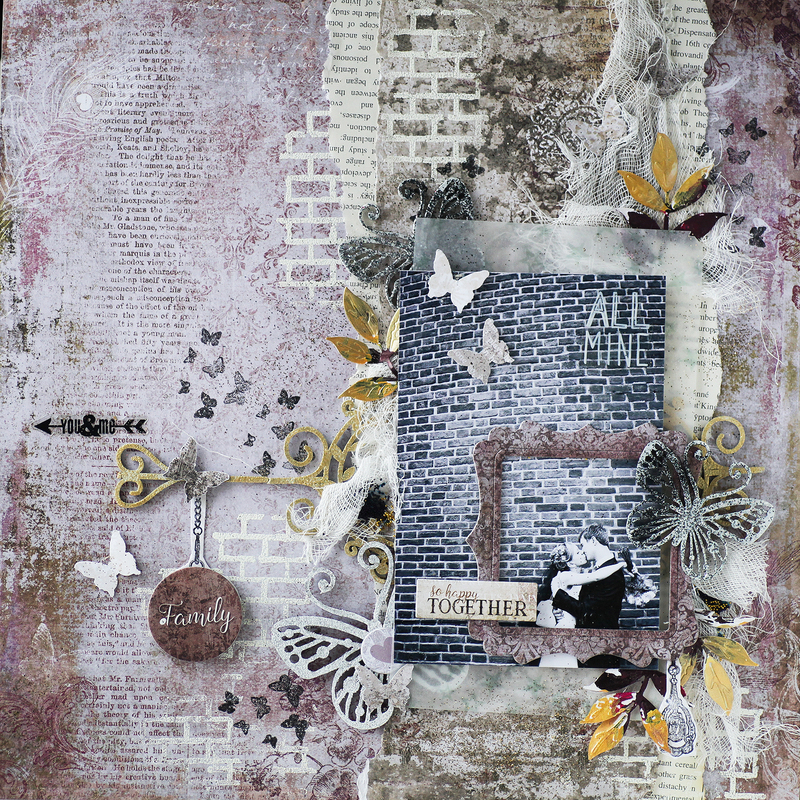 My preferred scrapping preference is 12 x 12 layouts and creating off the page/altered projects. 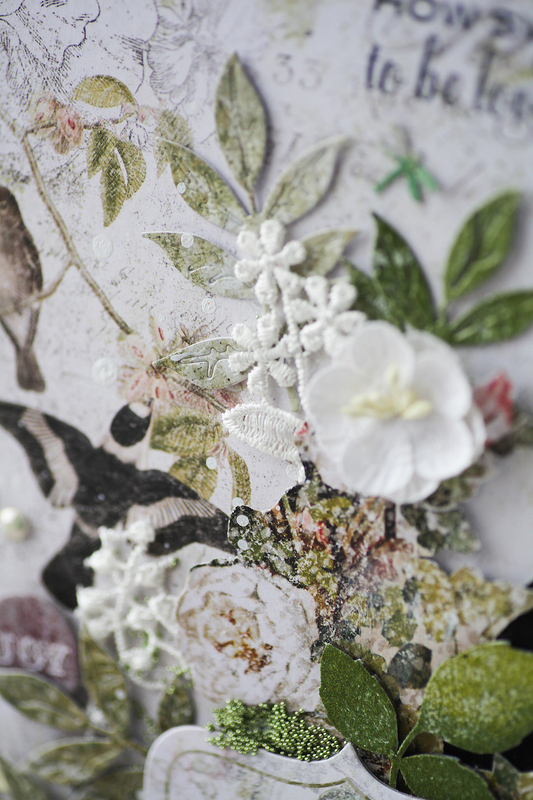 I am not locked into a specific scrapping style, as I am happy to give anything a go but I would describe my style as structured with lots of layers, fussy cut paper cutting, detail, dimension and whitespace! 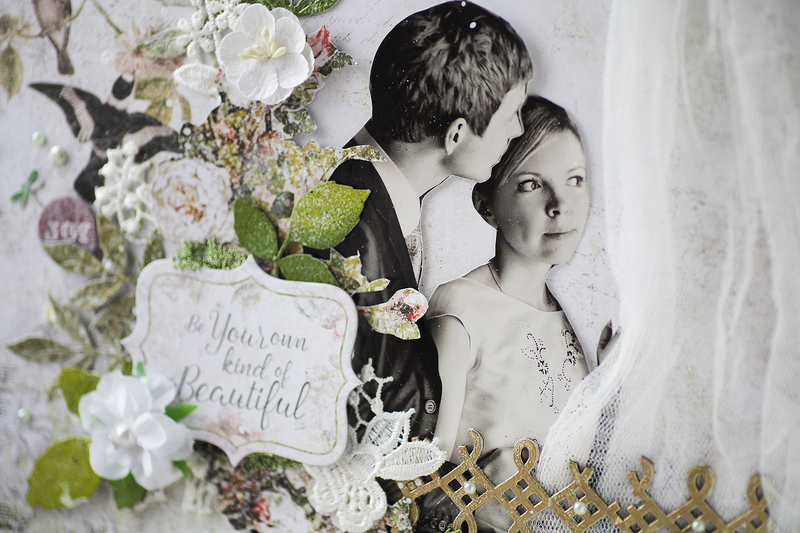 Whitespace is the main feature to many of my layouts, I love creating embellished clusters that draw the eye in. I am proud to say I have held design team positions for manufactures Prima Marketing, Graphic 45, Dusty Attic, Kaisercraft and Manourhouse Creations. 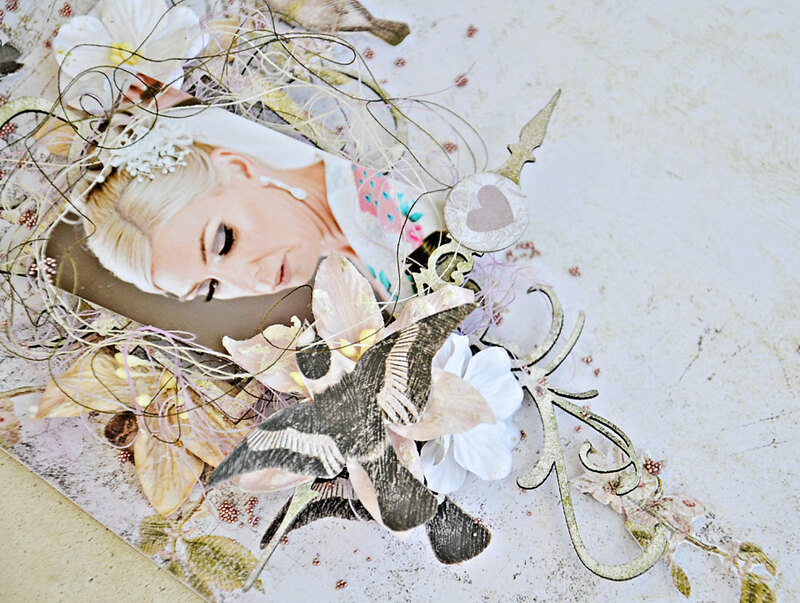 Now it is time for me to share my January projects, I hope you enjoy and they inspire you to create. 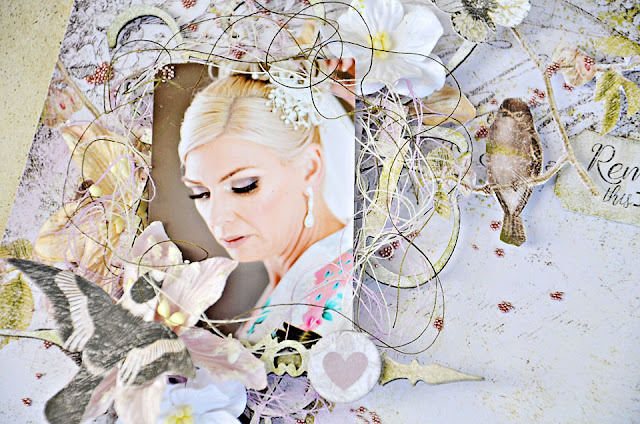 For my projects today I created with the new Remnants collection. This collection is beautiful! For this layout I used 2 pieces of the Devonshire patterned paper, the colour is simply gorgeous and so so soft. I used one as the base for my page while the other was fussy cut to create my dimensional corner cluster. How gorgeous are those birds? 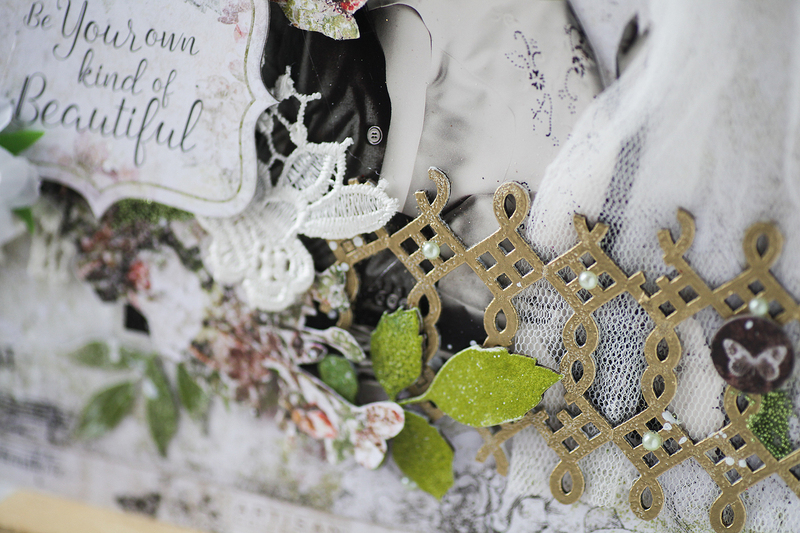 I added mini some mini chipboard flourishes and a smaller Techno Square behind my photo for added detail and dimension. The chipboard was all lightly inked with chalk ink as I wanted a soft finish to it, some parts of it were also embossed with Ivory embossing powder, so love that colour. 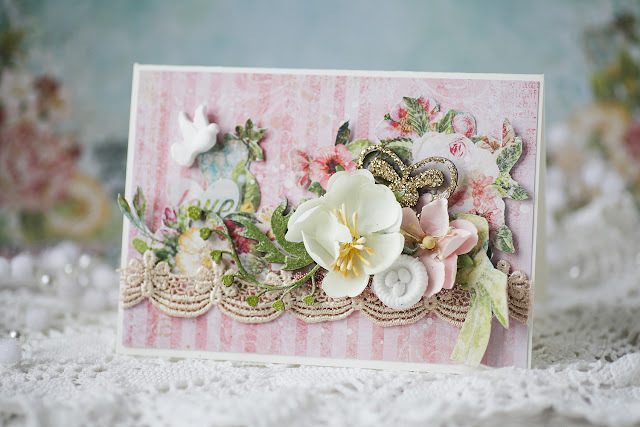 To make the layout quiet feminine I added some of the gorgeous pastel coloured lillies from the Harvest Lillies set, I then added some cotton thread for added softness. 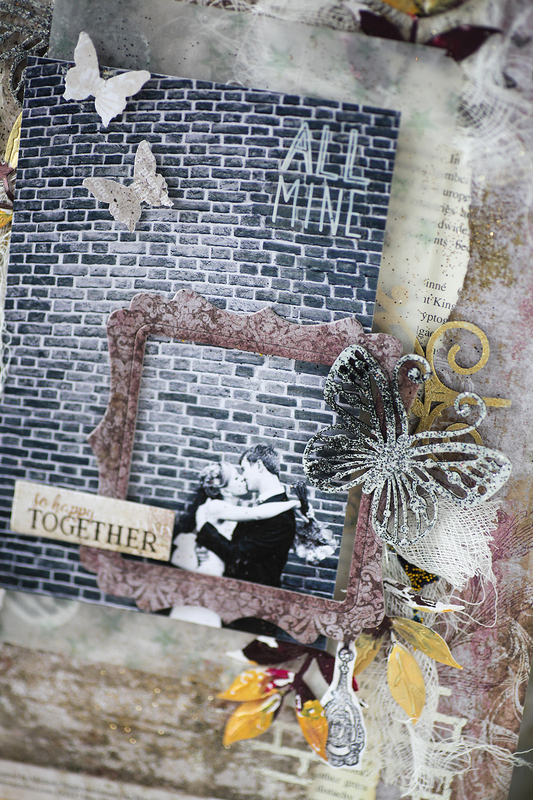 The title for the page is from the Remnants printed chipboard set. I also added some chalk ink to this to slightly soften the colour and make it blend more with the background. In the background I added a sprinkling of Mauve seedlings to compliment the page and some fussy cut butterflies. So my next layout probably has a bit more of a masculine feel to it but I have added small little details to help give it some softness. The colouring for this page was inspired by the colour of the Tungsten wedding band being placed on my brothers finger. 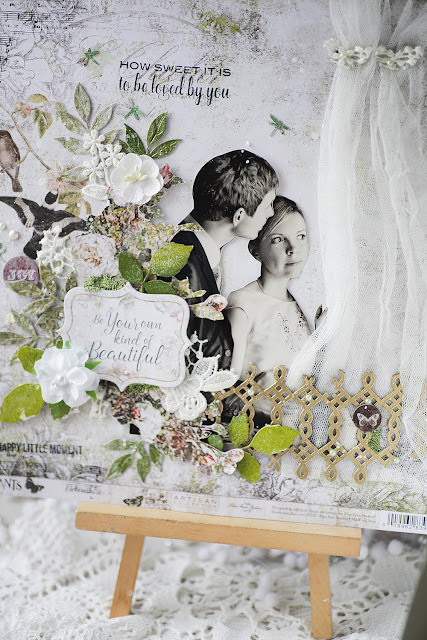 For this page I chose to use the Callaway patterned paper from the Remnants collection. I love the grungy feel it has while having a slightly purplish tinge to it. This layout still has a lot of white space happening even though the cluster is more large and open. It also has a steampunk feel to it which I love. The base of the cluster started with Bits Of Honey chipboard and then built up by adding Cogs & Gears chippy and some flowers. These were all painted with black gesso and then coloured with metallique wax. The background was stamped with the honey bits stamp and embossed with Ebony embossing powder. 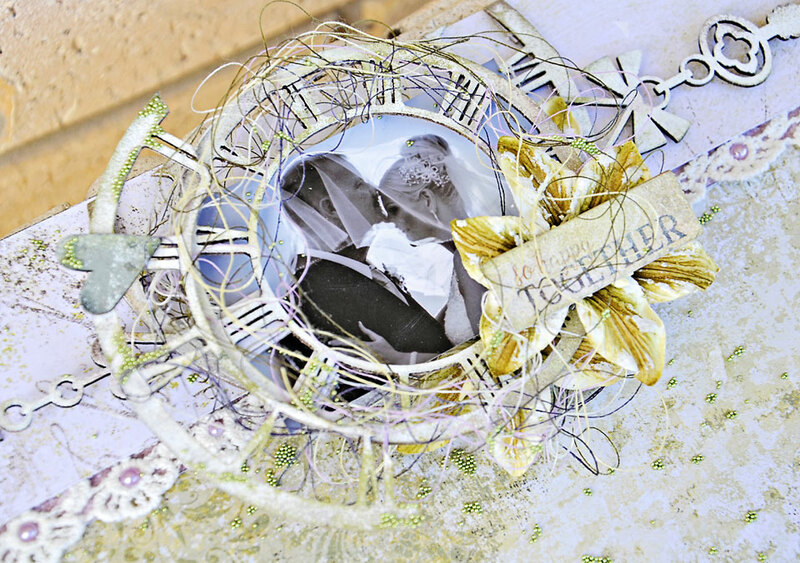 The circular frame over the photo are the throw away pieces from the small Roman Clock set, I never throw away chipboard shapes as you never know when they will come in handy. The Forever title piece was cut from the Families are Forever chipboard title. 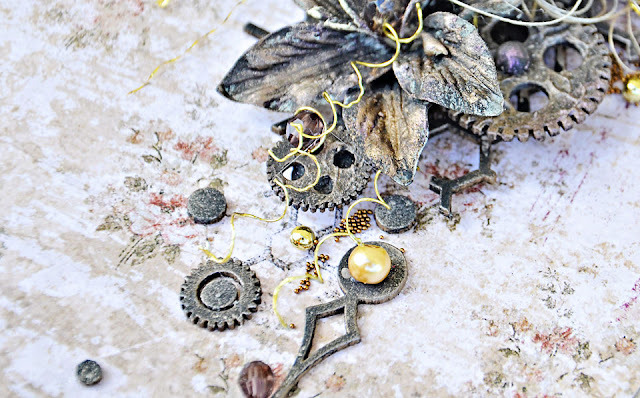 Throughout the background of the page I added a sprinkling of Twig seedlings and some coordinating beads and pearls. My final page today was created using the B side of the Callaway patterned paper and a strip from the Devonshire patterned paper. I cannot express how much I love the colouring of the Devonshire paper. it is just so pretty. 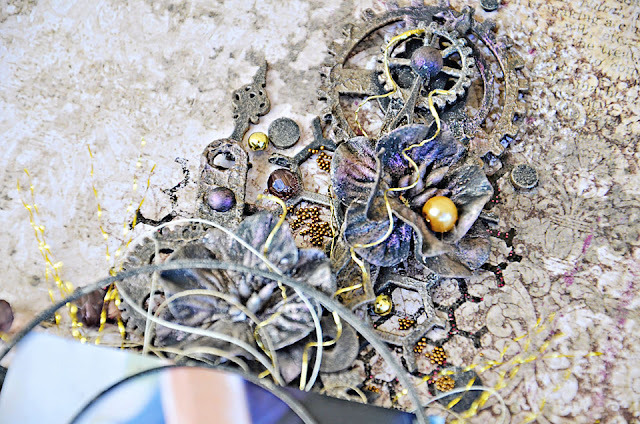 The main cluster was created using the Roman Clocks - Small chipboard set. I also added one of the chipboard dangles from the Romantic Page Dangles set. 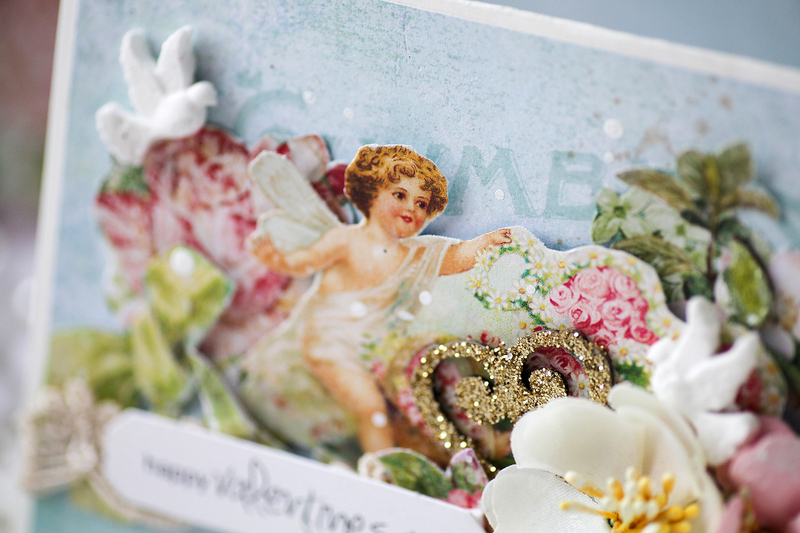 Some parts of the chipboard was embossed with Ivory embossing powder once again along with chalk ink. 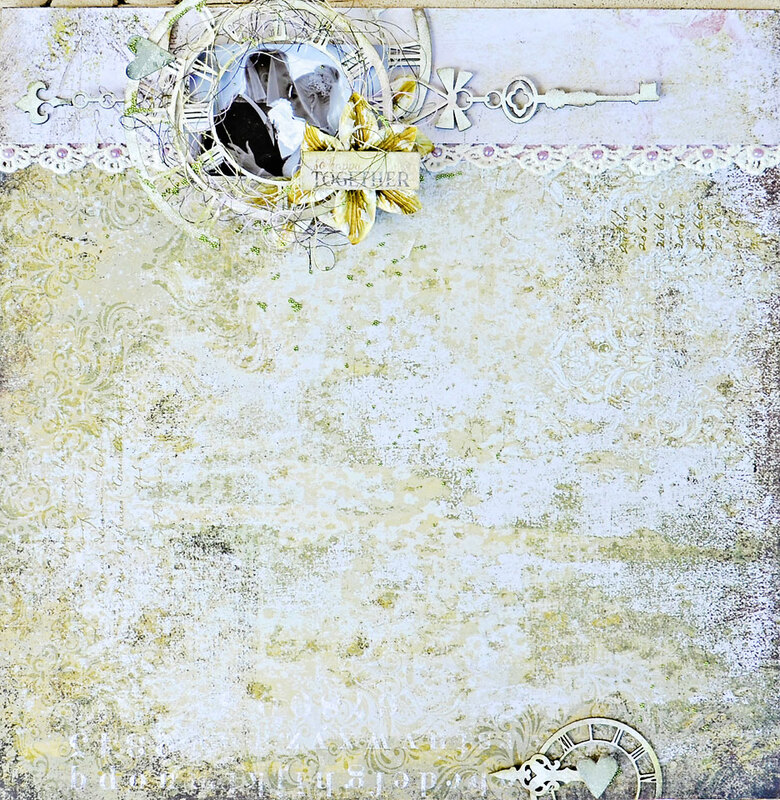 The title is from the Remnants Printed chipboard set and has again been altered with chalk ink to give it a softer colouring. 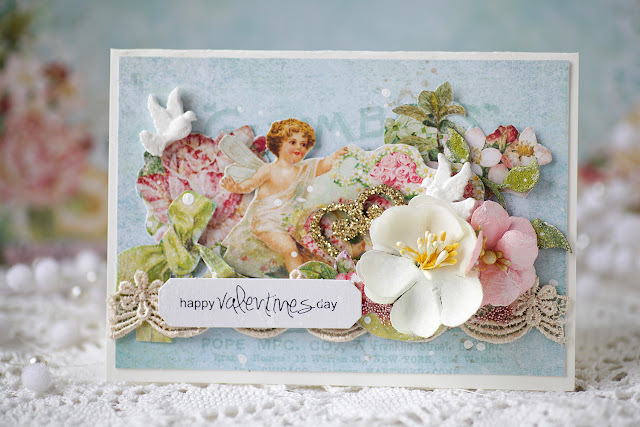 For added interest I added a couple of flowers from the Wonderlust Lillies set. Cotton thread was added and then a sprinkling of Meadow Seedlings to the background. Well that is it from me for this month, I hope I have given you some inspiration.